Berlin is the largest city in Germany and has a population of 3.4 million. Its urban landscape and historical legacy attracts a wide range of tourists of different age groups and from different countries, all seeking different experiences. A modern city, it is a hub for politics, science, culture, media and arts in Europe. Berlin's blossoming panorama includes world-renowned universities, research institutes, sporting events, orchestras and museums. Berlin is home to a multitude of diverse attractions. These are some of its most visited sights. Of the city's famous history, the fact that is best known is that as a consequence of the Second World War, the city was divided into East Berlin and West Berlin, and the famous Berlin Wall was the dividing line between the two. The construction began on August 13, 1961 and the wall was opened up on November 9, 1989. This wall separated East Germany from West Germany for more than a quarter of a century. Though contrary to official figures, a widely held belief is that more than 200 people were killed trying to cross the wall into West Berlin. The official dismantling of the wall by the East German military began on June 13, 1990. Today, very little remains of the Berlin Wall. There are three long sections of the wall still standing: the first one at the site of the former Gestapo headquarters, half way between Checkpoint Charlie and Potsdamer Platz; the second longer section along the Spree river near the bridge Oberbaumbrücke nicknamed East Side Gallery; and a third partly-reconstructed section in the north at Bernauer Straße, which was turned into a memorial in 1999. The section named East Side Gallery was painted upon in 1990 by 118 artists from around 21 countries. Berliner Dom in German means Berlin Cathedral, and is a Protestant basilica that is located on Museum Island in the Mitte borough. The magnificent Baroque structure dates back only from 1905, but stands on the site of several earlier structures. Within the richly decorated interior of the church lies the magnificent Sauer's Organ, the 1530 Elector's tomb, the neo-baroque pulpit and the stained glasses designed by Anton von Werner. The main altar, which was a part salvaged from the previous cathedral, dates back to 1850. The best vantage point of the dome and entire interior is at the end of a 270-step climb to the dome's gallery. Another interesting feature of the Berliner Dom is the crypt, which contains more than 80 sarcophagi of Prussian royals. Museum Island is located on an island in the Spree river in the center of the city. On this island, one can visit the Old National Gallery (Alte Nationalgalerie), Old Museum (Altes Museum), The Bode Museum, The Neues Museum or the Pergamon Museum. The Old National Gallery contains a large collection of 19th century sculptures and paintings, including works by well-known German artists of that century, and also many French Impressionist pieces. The Old Museum (Altes Museum), which has an impressive array of ancient Greek and Roman artifacts, was built by the famous German architect, Karl Friedrich Schinkel. The Bode Museum boasts of one of the world's largest numismatic collections and a selection of paintings from the Gemäldegalerie. A must see at the Pergamon Museum is the Ishtar Gate of Babylon. Potsdamer Platz is a bustling public square and traffic intersection in the center of Berlin. Named after the city of Potsdam, it was completely destroyed during World War II and lay in ruins during the Cold War. However, since the fall of the wall, this intersection has come to represent the modern Berlin, and has a plethora of modern structures, restaurants and places to shop at. It is Berlin's Times Square. The bustling city of Berlin has something to offer every visitor. Diverse experiences such as traveling back-in-time to recount the tragedies of the Second World War, or sampling a taste of modern liberal lifestyles, are on its platter. 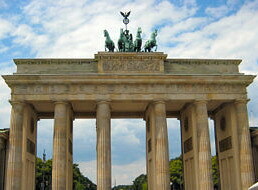 Berlin definitely warrants a visit, and is amongst the most sought-after tourist destinations in the European Union. About the Author - Marian K.